Following a year that saw the Big East send seven teams to the NCAA Tournament, the most since the league reconfigured starting in 2013-14, here’s what we know entering the 2017-18 campaign.The consensus is that the league has four locks for the NCAA Tournament – Villanova, Xavier, Seton Hall, and Providence. As for how fifth to eighth will look in the league standings, it’s more difficult to predict that than rocket science. With that in mind, here’s five Big East hoops storylines to get the brain flowing in July. 1. Omari Spellman will make an impact for Villanova. Just how big will it be? The 6-foot-9 power forward from St. Thomas More School in Connecticut had to sit out the 2016-17 season as an academic redshirt, but all signs point to him making a splash in the upcoming year. The league regular season crown is Villanova’s until a team takes it from them, but that’s why Spellman is so important for the upcoming year. While Darryl Reynolds was a viable option down low, the ‘Cats did not have much consistent post scoring. Add in the departures of Josh Hart and Kris Jenkins to Reynolds and Villanova will be looking for new sources of offense. They possess the best point guard in the league in rising junior Jalen Brunson, who was more than comfortable spearheading the offense last season. Now, he needs to find some new go-to options while being even more aggressive himself. The talk surrounding Villanova is that Spellman’s potential knows no limits. Let’s see how immediate the results will happen. 2. There’s a 2017 Elite Eight team that welcomes its major contributors back while bringing in the Big East’s best recruiting class. Wild, am I right? That’s the story for the Xavier Musketeers, who are powered by one of the nation’s best all-around players in Trevon Blueitt. Pair the 6-foot-6 guard alongside 6-foot-5 J.P. Macura, and they make up one of the most unique duos in all of college basketball. Xavier is a preseason Top 15 team and with early-season results, could get as high as the Top 5. Just how the Musketeers navigated through a six-game losing streak from February and into March, yet made the Elite Eight, the world will never know. 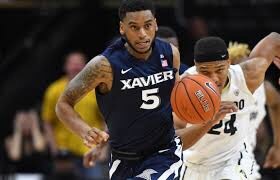 The key weapon for Xavier is highly-touted recruit Paul Skruggs. Ranked 30th in the ESPN Top 100, he looks to add point guard play. The Musketeers bring back Quentin Goodin after losing Edmond Sumner to the draft, but their future at the point is Skruggs. 3. Seton Hall will make three straight NCAA Tournaments for the first time since the program did so from 1991-94. But, can they make that long-awaited run? The Pirates have all of the pieces in place to be a second-weekend team. Pirates Coach Kevin Willard has built the program into a Top-20 team heading into the upcoming season. The biggest question – How can the Pirates improve offensively? Khadeen Carrington is expected to be the primary ball handler, and SHU has the core group of Angel Delgado, Desi Rodriguez, and Carrington to score the ball. Finding offensive consistency from the guys around that special trio will be the true teller for the upcoming year. Look for sophomore Myles Powell to take a leap, while the program hopes to have incoming freshmen Myles Cale, Jordan Walker, and Sandro Mamukelashvili all be contributors for another Big Dance campaign. 4. The league’s dark horse resides in Queens. St. John’s has plenty of talent on paper, but the question is whether Chris Mullin can turn that into results or not. SJU could be the toughest team to defend in transition in 2017-18. That’s not an issue at all, as Shamorie Ponds and Marcus LoVett will be joined by Michigan State transfer Marvin Clark Jr. in the upcoming campaign. The main area of concern – the Johnnies’ defense. The Red Storm ranked dead-last in the conference a year ago, giving up 78.7 points per contest. They must clean it up defensively, and one big way to do that is with shot selection on the other end. A lack of efficiency by Ponds and LoVett should improve as the two are another year older. Down low, 6-foot-11 Bashir Ahmed has been a rim protector, but SJU needs to see rising junior Bashir Ahmed have a bounce-back year. Kassoum Yakwe also looks to build in his second season. High hopes surround Arizona transfer Justin Simon as well. The 6-foot-5 wing gives SJU another weapon, something the Red Storm does not lack. 5. Patrick. Ewing. I’d be remiss to not bring up the Georgetown and Knicks legend. Ewing is back on the Hilltop, this time as the head coach of the Hoyas. Will he start to change the trajectory of Georgetown? While the Hoyas are in for a rebuilding campaign in 2017-18, it will be theater to see Ewing square off with Mullin and other coaches across the league. There’s no question that Georgetown is still one of the top jobs in college basketball. Will there be a sign in the upcoming campaign that says the Hoyas are on the right track? Stay tuned. After receiving a pledge of allegiance by Greg McDermott last month, it’s been all good news for Creighton recently. The Bluejays have already received two four-star commits for their 2018 recruiting class, as 6-foot-9 PF Ian Steere (High Point, NC) and 6-foot-7 SF Christian Bishop (Lees Summit, MO) have recently made their respective announcements. The Jays are one of those teams expected to be in a logjam in the middle of the league. Their non-conference schedule is highlighted by a trip to Northwestern, the Hall of Fame Classic, and a visit to…Gonzaga. Marquette’s spread-style offense is expected to be back in full force in 2017-18, as Markus Howard aims to take an even bigger leap as a sophomore. One name to remember – Harry Froling. The 6-foot-11 SMU transfer will be eligible after the conclusion of the first semester in the 2017-18 campaign, and for a Marquette team that loses Luke Fischer to graduation, Froling’s presence will be a welcome addition. The Golden Eagles announced their non-conference schedule as well last week. It’s highlighted by a home showdown with Purdue, the Maui Invitational, and a trip to Wisconsin. As life without Billy Garrett Jr. begins for DePaul, so does a new era. Wintrust Arena will be the new home of the Blue Demons starting this November, as Dave Leitao looks to get his program moving in a better direction. DePaul certainly has an appetizing game to open the new arena. The Blue Demons will host ACC Player of the Year candidate Bonzie Colson and Notre Dame on Saturday, Nov. 11. Junior guard Eli Cain takes the leadership reigns for DePaul, while the Blue Demons welcome in Marin Maric, a grad transfer who averaged 14.1 points and 8.4 boards per game for Northern Illinois last year. While the Blue Demons will be in the back-half of the league again, a new arena based in Chicago can certainly help in a significant way on the recruiting trail.